Blackwood, New Jersey comes alive on the first Sunday of October with entertainers, vendors, shoppers, and families who converge on the area for the Blackwood Pumpkin Festival. This tradition began in 1992, and this year marks its 27th year. Over the years, hundreds of thousands of visitors have attended. The festival, presented by Mainstage Center for the Arts (MCA), takes place Sunday, October 7th, 11 a.m. to 4 p.m., in and around the area of MCA’s Performing Arts Academy, 27 S. Black Horse Pike, with the Black Horse Pike will be closed from the intersection of Church Road through Lake Avenue. The rain date is Sunday, October 14th. Pumpkin Carving Contest – sponsored by McDonald’s Blackwood. 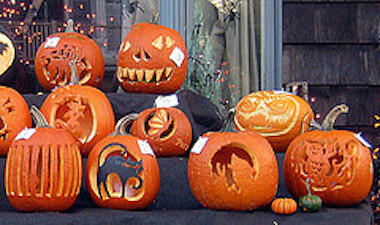 Please bring already carved or decorated field-grown pumpkins to Mainstage’s Academy Hall, 27 S. Black Horse Pike between 11 a.m. and 2 p.m. In addition to the primary sponsors listed above, the Pumpkin Festival sponsors include Bowman and Company, LLP; Joseph W. Bowley; CPA; Meadows Diner; Beneficial Bank; Castor Auto & Truck Repair; Comegno Law Group, PC; Lamp Post Diner; Republic Bank; Penzone Realty; Y.A.L.E. School; Zallie’s Shop Rite; South Jersey Gas, First Colonial Bank; Two-Two Creative; Preferred Party Rentals; McDonald’s (Gloucester Township); Valleybrook Country Club; Rahn AllGreen Turf Management; SERVPRO Blackwood/Gloucester Township; Mayor David Mayer and Gloucester Township Town Council; Senator Madden, Assemblyman Moriarty, Assemblywoman Mosquera; Winslow Animal Hospital; First Choice Solutions; Bob’s Garage; DPI of Cherry Hill; Sign & Design; Gardner Funeral Home; Life Storage Blackwood; Chews Florist; Rite Aid; Sports Specialties;; Blackwood West Development; Blackwood Lake Development, Township of Gloucester; Gloucester Township Chamber of Commerce; Camden County Regional Chamber of Commerce; Camden County College; Gloucester Township Rotary Public Library; Gloucester Township Public Schools, Black Horse Pike Regional School District: New Jersey State Council on the Arts; and the National Endowment for the Arts.